Ningbo is a romantic city, in her arms, a long road is extending to the distance, a tall building is pointing to the sky. Her road is the music chord, her bridges are the melody, the building represents the musical movement of life. October, in the middle of the golden autumn, is the moment we choose to express our feelings, and we have reason to write the music of life more beautiful and vivid, listening to an extraordinary and humorous modern music with the power to give us an experience of the dynamic of life through the melody flowing from the strings of the violins. 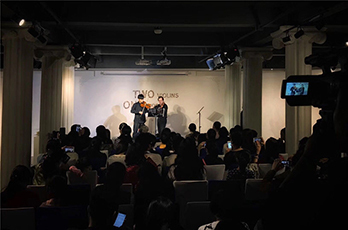 They are the Spanish violin Professor Mark and the Ningbo Youth Orchestra Director Yu Weiwei. The whole concert is based on the new music of modernist writers, interspersed with classical works of Mozart. In this atmosphere, sometimes serious and solemn, sometimes humorous, the audience experienced a unique audio-visual enjoyment.